Now this is not something I originally intended to blog about, it was just a lunch I made that ended up sparking a bit of a debate at my dining table. I made club sandwiches, having been inspired by Charlotte’s Ultimate Club Sandwich, just because it made me hungry and I fancied one. My club sandwiches differed from Charlotte’s in that I didn’t make my own mayonnaise (because I couldn’t be bothered) and I didn’t include the middle slice of bread (because I was running low). As I said, this was never intended to be a blog post. 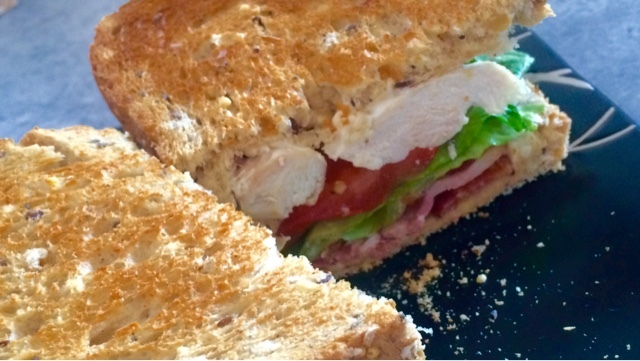 If it was then perhaps I would have made my own mayo and made sure I had enough bread, but when I put this down in front of The Boyfriend and told him I’d made him a club sandwich the response I got was: ‘Thats’s not a club sandwich. Where’s the cheese? Why is it toasted?’… and so a little debate began. What is the ultimate club sandwich? I will admit that, given that I think cheese pretty much improves everything, a good bit of cheddar would have been good in this sandwich. However, I left it out to go down the, in my opinion, more traditional route. It was the toasted or not toasted argument that really sparked the debate though. I insisted I’d never had a club sandwich that hadn’t been toasted and The Boyfriend insisted he’d never had one that had. We settled the debate by asking our dinner guest later that evening who, obviously, agreed with me. But the whole thing got me thinking, what is in everyone’s ultimate sandwich? What would you add to make this better? Or even, what would you take away? Does the type of bread make a difference? And the biggest question of them all: to toast or not toast? 2. Place chicken on a baking tray, season with salt and pepper. Bake in the oven for 15-20 minutes. 3. Meanwhile grill or pan-fry the bacon. 4. When chicken is cooked, carve into chunky slices. 5. Toast the bread using the grill so you can do one side only. 6. Spread the untoasted side of the bread generously with mayonnaise. 7. On one slice stack the chicken, bacon, lettuce and tomatoes in the order of your choice. Top with the other slice. Cut in half.